Joan Crawford (born Lucille Fay LeSueur) was an Academy Award-winning American actress. Crawford is named as the tenth Greatest Female Star of All Time by the American Film Institute. Starting as a dancer on Broadway, Crawford was signed to a motion picture contract by Metro-Goldwyn-Mayer Studios in 1925 and played small parts. By the end of the '20s she became a famous flapper. Beginning in the 1930s, Crawford's fame rivaled fellow MGM colleagues Norma Shearer and Greta Garbo. She often played hardworking young women who find romance and financial success. These "rags to riches" stories were well-received by Depression-era audiences and were popular with women. 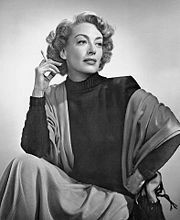 By the end of the decade, Crawford remained one of Hollywood's most prominent mo Joan Crawford (born Lucille Fay LeSueur) was an Academy Award-winning American actress. Crawford is named as the tenth Greatest Female Star of All Time by the American Film Institute. Starting as a dancer on Broadway, Crawford was signed to a motion picture contract by Metro-Goldwyn-Mayer Studios in 1925 and played small parts. By the end of the '20s she became a famous flapper. Beginning in the 1930s, Crawford's fame rivaled fellow MGM colleagues Norma Shearer and Greta Garbo. She often played hardworking young women who find romance and financial success. These "rags to riches" stories were well-received by Depression-era audiences and were popular with women. By the end of the decade, Crawford remained one of Hollywood's most prominent movie stars, and one of the highest paid women in the U.S.
For her performance in Mildred Pierce, Crawford won an Academy Award and in the following years, achieved some of her best reviews. In 1955, she became involved with PepsiCo, the company run by her last husband, Alfred Steele. After his death in 1959, Crawford was elected to fill his vacancy on the board of directors but was forcibly retired in 1973. She continued acting regularly into the 1960s, when her performances became fewer, and after the release of the horror film Trog in 1970, retired from the screen.